Last year I shared this post about my favorite quote from Roald Dahl. I shared more details on Roald Dahl and the artist Quentin Blake in the original post, and my cute little girl. I could read these beautiful and quirky words over and over again. I've wanted to hang this quote, especially the drawings, in my bathroom for a long time, but all I had was an old copy from a book. So I scanned the picture in and changed the font. 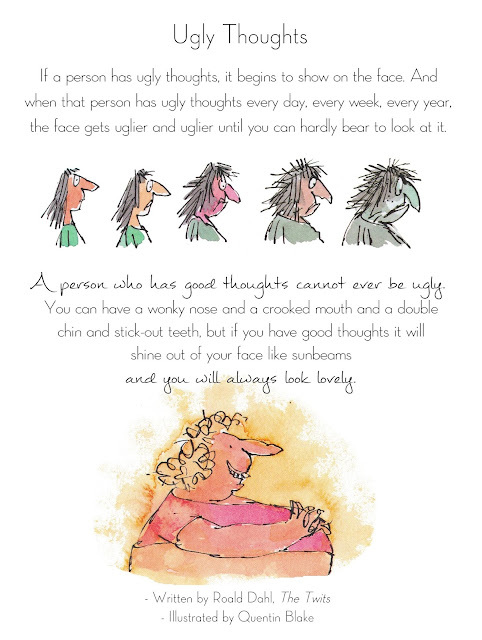 All credit is given to Roald Dahl & Quentin Blake. If you would like to hang this up in your home, closet, bathroom, etc, feel free to save image to your computer and download & print. You can also comment with your e-mail and I'll e-mail you a copy in JPEG & PDF. Or you can e-mail me springmcdonald(at)gmail.com. Hope you have a wonderful day and have good thoughts that will shine out your face like sunbeams.